For the children and teenagers rescued by a Kindertransport, the route to Great Britain always began at a train station. From Rhineland and Westphalia, the journey went through the Netherlands to Hoek van Holland, where ships departed to the harbour of Harwich. The Kindertransports from Zbąszyń first led to Warsaw by train and then to the harbour of Gdynia close to Gdansk. From there, the life-saving ships went through the Kiel Canal, right in the middle of Nazi Germany, before reaching the North Sea and finally the mouth of the Thames. 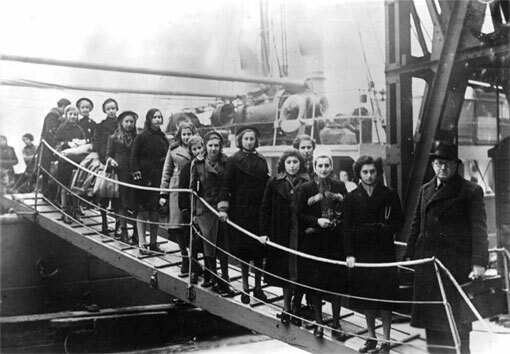 In May 1940, after the beginning of the war, a last Kindertransport reached Liverpool from Ijmuiden in the Netherlands. Kindertransport from Zbąszyń at arrival in London, February 1939. Photo Credit: Federal Archive, image 183-S69279.